This mime drawing is representing a character that you either love or hate. Indeed, a mime artist usually doesn't speak and only use gestures and body movement to perform. Some are fun and interesting to watch while others can be quite annoying! They can perform on a stage, in the street or even in movies. Some popular mimes over the years include Marcel Marceau, Bill Irwin and Oleg Popov. Of course, it's hard to forget people like Charlie Chaplin or Buster Keaton! First, let's draw the cartoon character using simple shapes and black outlines. Use rectangles to illustrate the body and circles for the ears and hands. Don't forget to draw special features like the stripes on the shirt, the makeup on the face and the hat. When you are ready you can proceed to the next step. 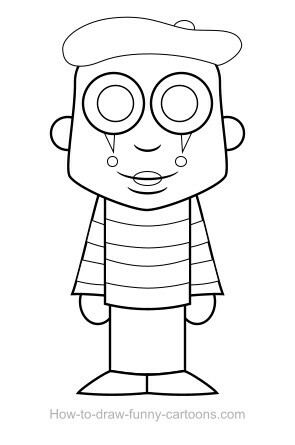 Remember that I am using a vector application to create this cartoon character. Time to add some colors on the cartoon character. Select each shape and add a flat color for now. The hat, the pants, the feet, the stripes and the pupils must be black. The makeup on the face must be colored in red. Only the hands are filled with a skin color. The shirt, the ears and the face must be filled with a light grey color. 2D colors are nice, but if we want to give some volume to the mime drawing, we need to perform a few basic operations. For instance, you can use the gradient fill tool available in your application to add a second color to all shapes available in this illustration. By placing the darkest color on the bottom, you can add more depth to the shape like shown on your left. See how the shirt is darker on the bottom? This simple tip is nice, but we can do much more to make the illustration more alive, more appealing. 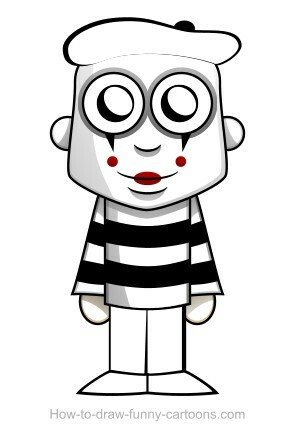 Draw new shapes on the left side of the mime drawing. You can add shape on the left side of the head, the shirt and the ears. For now, these new elements must be darker and grey. I also like to add a few circles around the eyes to make them easier to read. Using transparency, select each shape drawn previously and play with the opacity until the effect is more subtle and easier to read. Shadows must be visible, but still soft enough so that they don't become visually distracting. 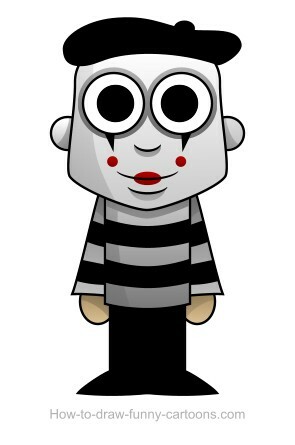 Shapes around the eyes can be slightly darker. Adding darker shape was a nice idea, but now we need to create brighter shapes to give more life to the character. Duplicate all shapes one-by-one and change the color so that all new elements are white. It's also a good idea to make sure that new shapes are slightly smaller than the original ones. For example, take a look at the hat on your left. See how the new white shape is smaller and how the hat behind is still visible. Now that all new shapes are created, let's play with the opacity again to obtain a cool result! Previously, we changed the opacity of the darker shapes to create shadows. Now we need to partially hide the white shapes to give more volume to the character. Once again, look at the hat on your left. See how the right area seems brighter? See how the left area is still dark and flat. White shapes are use to give more volume to each element. Combine with the dark areas created previously, we now have a professional result!